Top Ten Things to do in Paris from a Local! People often ask me what they should see when they come to Paris. Truth is, I feel incompetent to respond as my daily life here is far from the world of tourism, except for being annoyed with tourists ignoring the bike lanes! (Please, watch where you are walking!) 🙂 So I tend to think that people are better off doing a quick Google search for the top ten attractions to make the best use of their vacation time here. Although I have seen many of the touristic sights (mostly before I lived here), “what to see” really depends on your personal interests. There is so much to discover! However, because some have insisted, here is my own list. If you shadow me for a few days, these are the activities you might find me doing, although some only on a rare occasion. But here’s a disclaimer: these activities are very specific to my life and interests! So they may or may not appeal to you. Also, since I have to live modestly in an expensive city, all of these activities are either free or quite affordable (10€ or less). I hope you will find something useful here. It’s incredible that you can step just outside of the city and get lost in a 2500-acre park. 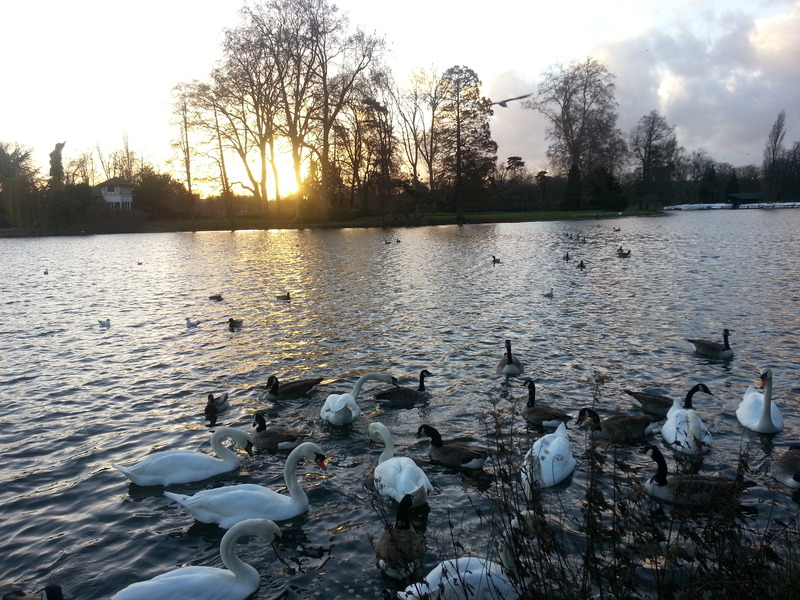 Year round, I love running in the Bois de Vincennes. There are lakes, paths that stretch on for miles, plenty of trees, a castle, a floral garden, and a hippodrome. It’s a great place to go for a walk, run, bike ride, picnic, etc. In the summer, you can also catch free concerts in the Parc Floral (5€ to get in, then the concert is free). You can access the Bois de Vincennes from Metro line 1 (Chateau de Vincennes) or line 8 (Porte Dorée, Liberté). However, I would recommend staying out of the park when it’s dark. The streets of both Bois de Vincennes and Bois de Boulogne are lined with prostitute caravans at night and this of course significantly changes the atmosphere from of a place of light, families and athletic energy in the daytime to a place of darkness and illegal activity at night. This is the market where I used to buy fresh produce almost weekly. It’s a bit of a jog from where I live but I took the time to go there because it seems to be the cheapest market in Paris. I could fill my caddy with fresh fruits and veggies for a mere 20€ – a real steal! It is also interesting culturally. Step inside and you will find yourself surrounded by Asians at one end and Arabs at the other, complete with multiple languages and clothing styles. Hold onto your wallet and be prepared to be shoved around a bit as you make your way through the crowd. While the prices are fixed, you would be wise to pick your own fruit, as sometimes the quality is less than desirable, especially when the merchants try to convince you of what to buy. If you exit the metro at Belleville (line 2 or 11) or Couronnes (line 2) on a Tuesday or Friday morning, you will find yourself in the market. In my continued effort to “go green,” I now prefer the market at Bastille because there is an organic vendor where I can even find kale! More expensive yes, but for my health it’s worth it! Located near Metro Bastille, this market is open on Thursday and Sunday mornings. The Paris city bikes (Velib) are my primary means of transportation. For a resident, it’s super easy. You pay 39€ for the year and have 45 minutes free every time you check out a bike. The concept is brilliant: take a bike from one station, ride to your destination and return it to another station. So you never have to worry about your bike getting stolen and if a pedal falls off or a tire goes flat or if it starts down-pouring (I speak from experience! ), you can simply park it at the nearest station and move on with another means of transportation. The downside to this system is that there is not always a bike or a free spot available when you need it. However, since there are stations all over the city, you can often find another one within a five-minute walk. A new option allows visitors to purchase short-term passes online in advance. I should caution visitors to be careful while biking in Paris because traffic can be crazy, especially in the roundabouts. There are a lot of bike lanes, but pedestrians are often in the way and much of the time, you have to share a lane with the city busses, which aren’t very considerate at times. 😦 Because of this, there are certain streets that I try to avoid when on a bike, and I always expect that I’m invisible to most of the traffic out there. I now know Paris quite well and can get around easily on a bike. However, I got lost a lot in the beginning. It’s hard to navigate the streets with a map and still be cautious of the traffic. Getting around on the metro is much easier and straightforward for visitors. However, biking is a great way to see the city if you’re up for the challenge. Guided bike tours are another good option. Check out Bike About Tours and Fat Tire Bike Tours. I have never used these services, but when I see people on the tours, they seem to be enjoying themselves! If you’re in Paris on a Sunday and would like to experience a thriving French church, consider attending one of the services at the Eglise Protestante Unie du Marais at 17, rue Saint-Antoine in the 4th arrondissement (in-between Metro stops Bastille and Saint-Paul). The Sunday services are at 10:30am, 5:30pm and 7:30pm. You can try out your French here, but you will be sure to find some English speakers as well. You can easily stop in a grocery store and pick up cheese, wine, fruits and veggies and some bread from a bakery (boulangerie) for a simple picnic in a park. Some of my favorite picnic spots are: Luxembourg, Buttes Chaumont, and Champs de Mars. On July 14 (the France national holiday) and on New Year’s Eve you can also see fireworks at the Eiffel Tower. Most tourists go up the Eiffel tower for the view, but if you would like a more classy experience with a panoramic view of the city, I recommend the Ciel de Paris restaurant, at the top of the Montparnasse Tower. It’s free to access the restaurant, but the service is expensive. So on occasion I’ll go up at around 3pm (when it’s not too busy) and order a tea. It will be pricey, but if it’s clear out, you’ll have a great view! And it’s still less than a ticket to go up the Eiffel Tower. It reminds me of the Signature Room at the top of the John Hancock Center in Chicago, which I always suggested as an alternative to the Sears Tower (sorry, I still can’t refer to it by that other silly name). A little art gallery on a side street in a chic quarter, the Pavé d’Orsay hosts art showings, concerts, acting workshops and other events to promote emerging artists. Check out what’s on and stop in for a visit, especially if you’re in the area visiting the Musée d’Orsay or the Louvre. 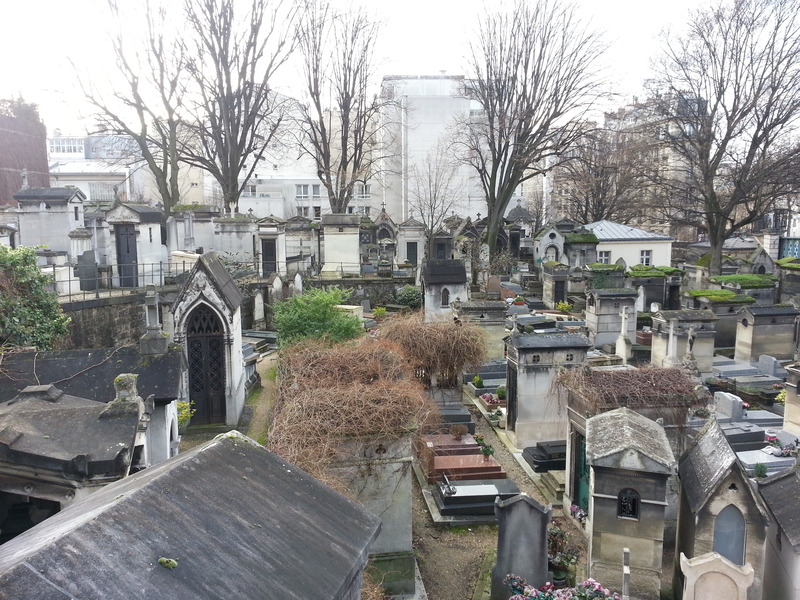 The cemeteries in Paris can redefine an American’s concept of a graveyard. You can almost get lost amidst the tombstones. Whenever I stroll through one of these cemeteries, I always discover so many interesting things, from the old sculptures to the recent pictures and inscriptions. You can also find the graves of many famous people in Paris. Catching a concert or opera will take some planning in advance (if you want to get a ticket for a decent price), but most tickets you can buy online and then print out, so it’s simple to do from a distance. There are two opera houses, the old famous one (Garnier) and the newer one (Bastille). The latter hosts most of the opera productions and the older one is where ballets generally take place. For shows at either location, check out the Paris opera website. Ticket sales open on a specific day for each production and if you reserve the same day, you can get tickets for as little as 5€ (although you may have an obstructed view at this price). For orchestral and other classical music, check out these two concert halls: Theatre des Champs-Elysees and Salle Pleyel. And for a vast array of concerts and other shows in Paris, look for tickets at this site. It’s a bit hidden away, but it’s definitely worth finding for an excellent falafel. You can sit in or pay less for take-away. It’s called “L’As du Fallafel” and is located at 34, rue des Rosiers, 75004, Paris. The closest metro stop is Saint Paul on line 1. Now for the more touristic things to do in Paris, please ask google! This entry was posted in Culture, Paris, Travel. I have been to Paris twice, but I’ve never done any of these things. They all sound great! All the more reason to come back and visit you next year! 🙂 Thanks for sharing and including pictures!